We do not see or collect your Facebook login credentials (username or password), they are provided by you direct to Facebook by our approved Facebook Connector. A user of Facebook must be at least 13 years or older to register and we do not knowingly collect information on children under the age of 13 years old. Important note: By providing alerts and information through email, you understand and accept that terms of our service include communication via email. 1. INFORMATION YOU PROVIDE. There are several activities on our Web site where the collection of personally identifiable information is necessThere are several activities on our Web site where the collection of personally identifiable information is necessary. For example, when you register you provide your email address and the Facebook credentials of your child. We collect only the information you provide through our website on forms you accept and the information provided through the standard Facebook applications developers kit. When you make a purchase, we use a trusted third party (eg Paypal) to process your credit card information. We do not obtain any of this information directly and it is not stored on our servers. 2. INFORMATION WE COLLECT. In addition to the information you provide, when you visit our Web site, we may collect information regarding the type of browser you are using (eg Internet Explorer version), the type of operating system you are using (eg Windows or Mac OS) and the domain name of your Internet service provider (eg America Online). This non-personally identifiable information is used to make our Web site as highly usable as possible for the widest variety of users. We do not track websites that you have visited. We may also use email links located on our Web site to allow you to contact us directly with any questions or comments you may have. The information you provide in such emails is used to respond directly to your questions or comments, but may also be used to improve our Web site and its content. We may also review and discard the information provided in such emails. 3. HOW WE USE THE INFORMATION. We may use the personally identifiable information that you provide, as well as the non-personally identifiable information that we otherwise collect about you, to fulfill your requests for our products, programs and services (e.g., billing etc. ), to respond to your inquiries about our offerings, to offer you other products, programs or services that may be of interest to you, and to otherwise contact you. These products, programs and services may be ours or those of our trusted subsidiaries, affiliates, business partners or sponsors. You have the choice to opt out at any time. We will never disclose your credit card information or your personal identity information for marketing purposes. However, we may disclose personally identifiable information in response to legal process, For example, in response to a court order or a subpoena or a law enforcement agency's request. We may disclose personally identifiable information in connection with the sale of assets or our business. 4. OPT OUT POLICY. You may request at any time that Featherbrooke Inc. not send any future e-mails, with the exception of those as provided per your service agreement (i.e. alerts) by unsubscribing from the communication. 6. HOW WE HANDLE CHILDREN'S PRIVACY. We do not target or sell products, programs or services to children. Children under 13 years of age may not submit personally identifiable information without the consent of a parent. We do not provide any personally identifiable information about children under 13 years of age to any third party for any purpose whatsoever. We cannot be held responsible where a user has misrepresented their age to us or on a Facebook account we are monitoring for the parent. HOW YOU CONTACT US. If you need further assistance, if you have any questions or concerns, or if you would like to modify your personally identifiable information in any way, you may send an email to support@creepsquash.com. 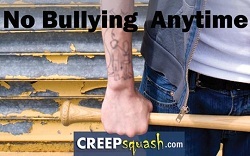 "As with any great idea opportunities exist for those with immoral or dishonest intent – My family's safety is not negotiable – Creepsquash has my stamp of approval."